In his book Tribes, Seth Godin suggests that we forget about the easy and focus on the effective. "The easiest thing to do is react," he says. "The second easiest thing is to respond. But the hardest thing is to initiate." Reacting speaks of being unprepared and under equipped. It is almost always used with a negative connotation. Zig Ziglar says, "Reacting is what your body does when you take the wrong kind of medicine." We say things like, "He had a bad reaction!" Responding is much better than reacting. For example, most people react to an emergency but an EMT responds to an emergency. Or a similar example would be a firefighter; he is prepared and equipped to deal with fires, but he has no control over when and where the fire will be. The result is that he responds to one fire after another. 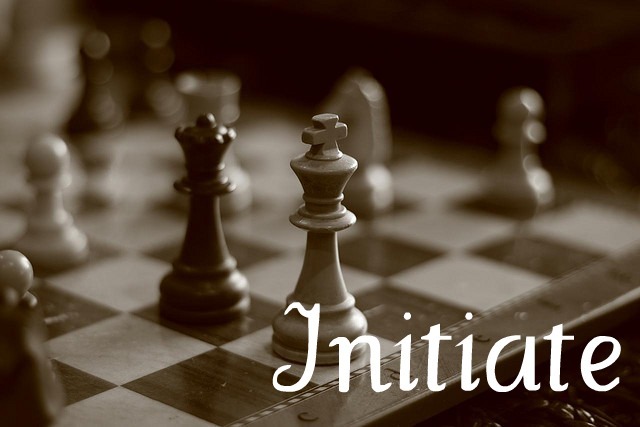 Initiating is what's really effective. Initiators see things that others don't see. They make things to happen. They create change. As Seth puts it, "They cause the events that others have to react and respond to." They start the fires! Think of how all of this relates to the important task of witnessing. Are you a reactor? When someone asks what you believe or why you conduct yourself the way you do are you left stammering for a response? Does your response usually start with, "Well, my church teaches..." If so, you may be unprepared and under equipped. That normally leads to a bad reaction. Are you a responder? I agree that our life should be lived as an example of Christ's love to everyone around us, but we tend to use that as a crutch when it comes to witnessing. We say things like, "I will witness to them if they ask me first." That is a very responsive approach to witnessing. Much more effective than reacting, but still not the greatest. The most effective (and most difficult) approach to witnessing is to be an initiator. Speak up! Open your mouth and tell somebody. Use wisdom to create opportunities to share your testimony. Trade the easy for the effective; start a fire!